The Sony ECM-MS2 Stereo Electret Condenser Microphone is designed for mounting on professional camcorders equipped with 2 XLR inputs and phantom powering. The microphone also delivers good sound performance in field and studio-production applications. The MS microphone signal of the ECM-MS2 microphone is internally decoded, and provides L and R (stereo) outputs. The MS2 stereo microphone also supports mono operation by simply unplugging the right channel (disabling phantom power from the right channel XLR connector). The compact 5.39" (137mm) length of the microphone prevents inadvertent vignetting of the microphone when it is attached to a handheld professional camcorder such as the PMW-100. Additionally, this short length is convenient when packing and transporting the microphone with a compact camcorder. The microphone offers mono operation when stereo is not required, simply by cutting off the power supply to the right channel; for example, when a wireless microphone system is connected on 1 channel or while recording environmental sounds on the other channel. The microphone is designed for applications such as news gathering and documentary shooting on location. Professional quality is assured through the XLR3P's outputs, which enable connection to professional camcorders for 48V phantom powering. The microphone's metal body also enhances audio performance by blocking vibration, resonance, and RF noises. The supplied furry windscreen is used to suppress the strong wind present in typical harsh-climate operating conditions. A cable tie is also supplied to fasten the unplugged microphone cable during mono operation. Box Dimensions (LxWxH) 9.45 x 5.2 x 3.0"
ECM-MS2 Stereo Electret Condenser Microphone is rated 4.7 out of 5 by 23. Rated 5 out of 5 by Frankenwick from Mic Condenser upgraded from ECM-XM1 To ECM-MS2 Having used the mono XM1 with my HXR-NX30 with excellent results, I hesitated trying the stereo upgrade for my HDR-AX2000. I have been recording loud music gigs and feel the overall sound quality is just as good if not a tad better... It has a better signal-to-noise ratio, as the staff has informed me. I originally had an Audio Technica AT875R and although the specs were comparable, there is no comparison to these Sony mics in the same price range. The Sonys are much cleaner sounding with less distortion. I have not used it often enough to tell how left-to-right 2-channel separation sounds, but regardless, it's a keeper. Highly recommended. Rated 5 out of 5 by Brian from A Must-Have for the Sony FS5 The built-in mic on the Sony PXW-FS5 just doesn't cut it for me. I knew I would have to get an external microphone the second I listened to the on-board camera audio. Even considering it as scratch audio is kind of a joke. That said, I'm very satisfied with this condenser microphone and records usable audio for my projects. It's also smaller than what I was expecting, which is fantastic because I was worried it was going to bulk up the camera even more while I want to keep the physical size down to a minimum. Rated 3 out of 5 by Paul from Not great for hand held use Sound quality was thin to my ears.Mono mode wasn't good for picking up dialog. Side pattern hears the servo motors while zooming on my Z150 Sony Camcorder. Lots of handling noise too and so it's not great for hand held use. I'm sending it back & will spend more $$$ on something better. Rated 5 out of 5 by WLWT Donny from Great stereo microphone This is an affordable and compact microphone for handheld camcorders. Much better stereo quality then the built in mic on the camcorder. Reasonably priced for a professional mic. Interesting and unique supplied furry windscreen. The XLR cables are somewhat long, and I had to use the cable tie. Since this was a special order item, it took four weeks for me to get it. 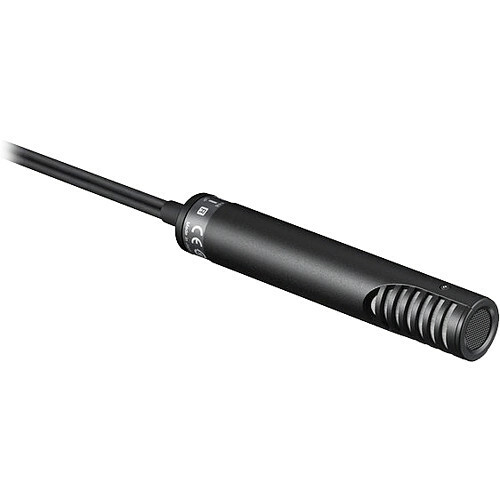 Rated 5 out of 5 by Alex from Good, versatile mic Excellent sound at a reasonable price from this compact stereo mic. XLR connectors work well with Canon XA20 or other pro gear. The option to use this mic in stereo or mono mode is a plus. We've also found this mic to do a good job of capturing stereo audio in a roundtable set-up by boom mounting over a table of 2 to 4 people (just make sure L and R are aligned with the camera view). Note that the QuikLok MP-892 mic clip works well if you need to put this mic on a stand or boom. Rated 5 out of 5 by Main Event Video Productions from Great small shotgun Great external mic for small cameras. It fits perfectly on my Sony PMW 100. This small camera requires a small shotgun. The pick-up pattern works very well. Also, there are two XLR connectors for left and right channels. A little mic for a little camera! Rated 5 out of 5 by NickMDal from Beautiful audio! Perfect with Canon XA10 and XA20. Such beautiful sound from this little mic. Perfectly mates with Rycote 5cm miniscreen (had to special order), with the Rycote mini windjammer pulled over it. Almost no wind noise! Rated 5 out of 5 by Johnny from Sony is always my best brand name Very good microphone. I bought this for my new PXW-X70. I prefer the foam that covers the windscreen than than this fur. It looks like I have a dead cat on my camcorder. I recently bought this mic for a Sony NX100, and although it fits in the mic holder, it's a little loose. Is there a mic sleeve that I can buy to make it more snug? Thanks for any help! You may consider using the Sanken ROCS Rubber O-Rings (B&amp;H# SAROCS) for a tighter fit. Is this mic compatible with the Sony HXR-NX3/1? Yes it is. The camera will provide the phantom power that the mic requires. You might want to get these o-rings (SAROCS) to keep it in place if you mount it on the camera's mount. I recently purchased the ECM MS2 mic and no where in the instructions or users manual does it tell you how to hook up phantom power. I have the NEX FS700 camera that this mic is for and both channels can be set to use phantom power, but that is if you are using two separate mics. How do I properly set up phantom power for this mic? I recently purchased the SONY PXW-X70 PROFESSIONAL XDCAM CAMCORDER. It comes with an XLR handle with microphone holder, but no mic. Is this the right one to pair with it? Are there other (better) options? I want to outfit the camera right. Thanks. I purchased this microphone over a year ago for my PD150; and I've been very happy with it's performance and ease of use. I recently purchased the SONY PXW-X70 PROFESSIONAL XDCAM CAMCORDER. It comes with an XLR handle with microphone holder, but no mic. Is this the right one to pair with it? Are there other (better) options? I want to outfit the camera right. Thanks. I am referring to the Sony ECM-MS2 Stereo Electret Condenser Microphone BTW. How long are the XLR cables? Asked by: Dale Ryan L.
I measured and found it is exactly 18 from the base of the microphone to the tip of the XLR plugs. Answered by: John L. G.